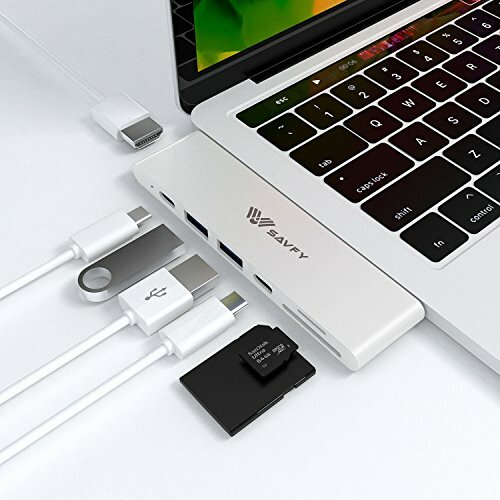 SAVFY Type-C Pro Hub Adapter is the newest addition of USB-C collection. Sleek and compact, the Pro Hub Adapter features a Thunderbolt 3 port, USB-C port, 2 USB 3.0 ports, and SD/Micro card reader. Simply, plug and play to expand your MacBook¡¯s capabilities. Newest Aluminum Type-C Pro Hub adapter, capable of simultaneously transferring data and charging devices. Designed for Apple 2016/2017 MackBook Pro, including 13'' and 15'' models. System requirement: macOS Sierra or above. Slim & Compact: Compact and easy-to-use design makes it easily to take it anywhere you go, perfect for home, office, business and travel. Plug & Play: Support hot swapping function, does not require any software, drivers or complex installation process. For best connection, please use without a laptop case.